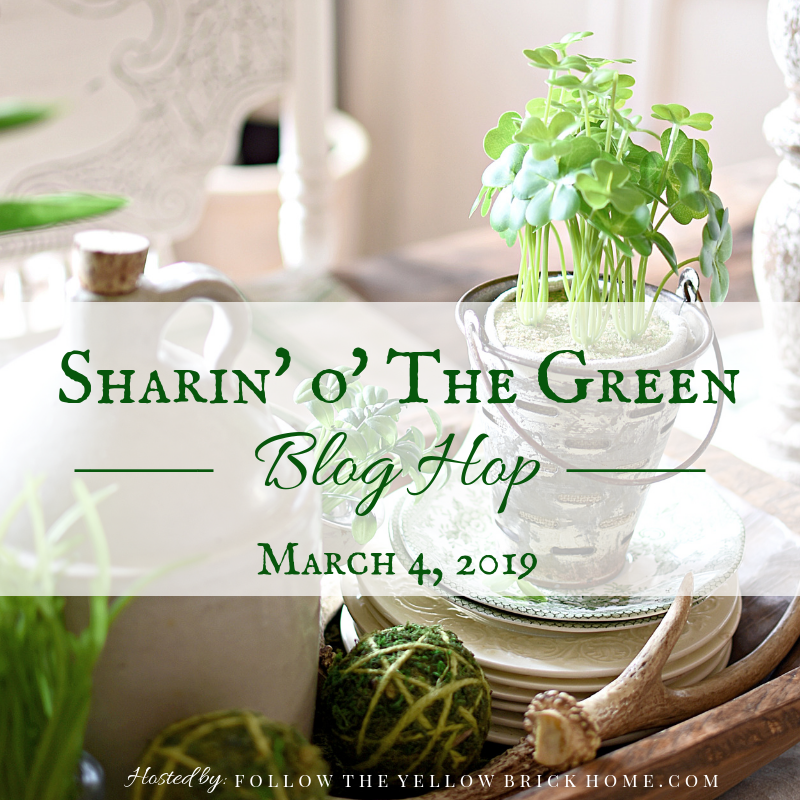 I am thrilled that I have been feeling good enough that I am able to join a group of talented ladies for this fun blog hop hosted by sweet Amber from Follow The Yellow Brick Home! If you are hopping over from Laura's at Decor to Adore I know that you have been rewarded with her fabulous style! I always wonder what people will notice first on my porch. 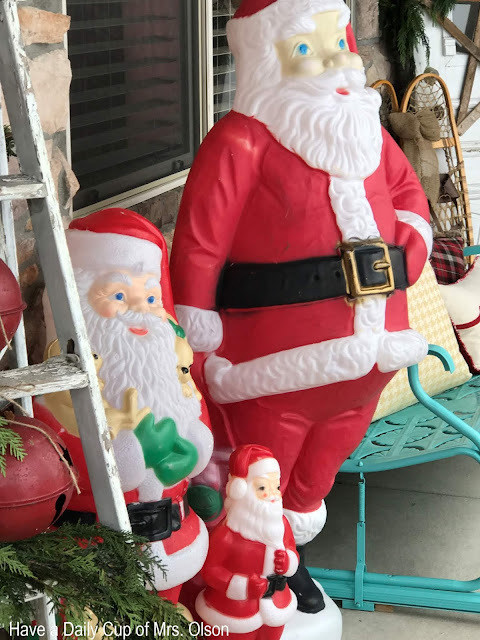 If you are a kid at heart, like me the chances are it might be my trio of Santa blow molds. The large one was a $5 thrift store find years ago. I bought the middle sized one from my older sister, Dolores, and the little guy was found at a thrift shop as well. I love them! I usually move things around on the porch. Because I am not suppose to lift more than 10 lbs., I left it as it was. That made hubby happy. :) Santas mouth is hidden behind the old wooden window frame. I need to move it. Honestly, it may or may not happen. but then I added the red/green picnic basket, the Coleman heater, and the welcome mat. The wreath on the door is very simple. I bought it at Hobby Lobby 5 or so years ago. It says, "Holiday Greetings" to me. The wooden star came from a fun antique store that is no longer open. It was called, "Star Mill Antiques". I miss it! Our youngest son cut down a huge tree in their yard that died. Hubby and I borrowed a few logs. I need to get a bit more greenery to go inside this basket. But look at that snow. How perfect is that? 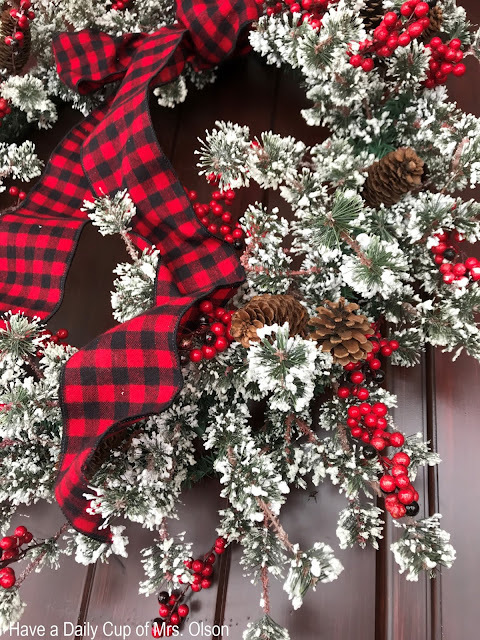 Wishing you all warm wishes this holiday season! 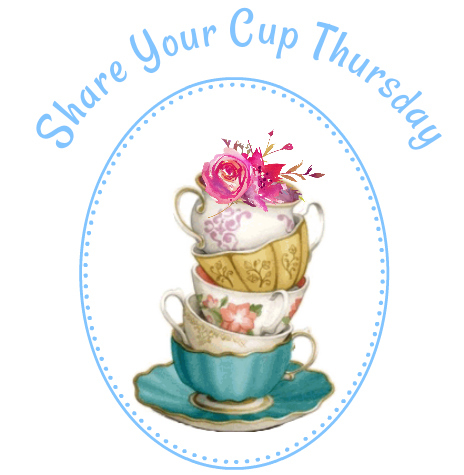 Now hop on over to Cecilias My Thrift Store Addiction for some wonderful vintage inspiration. You will want to visit all of these talented ladies! Jann no one creates more lovely collections of vintage goodness than you! I adore your collection of light up Santa's. So glad to hear you are feeling a bit better. Will keep you in prayer sweet friend! 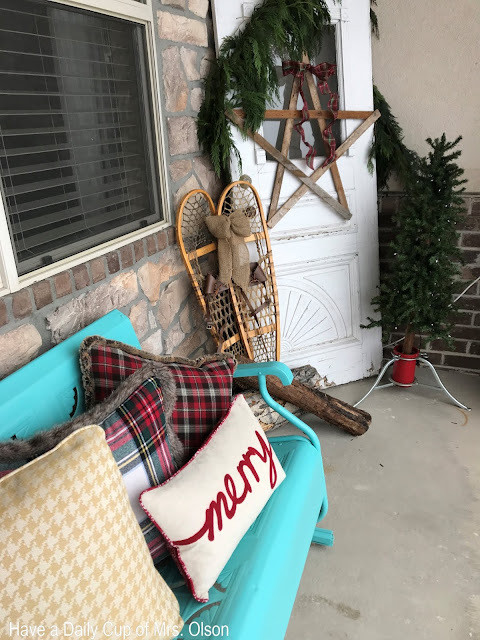 I love all of your vintage touches on your Christmas porch! Especially those Santa's!! The snow just makes these photos magical! Happy Holidays my friend! I am in love with your front porch. 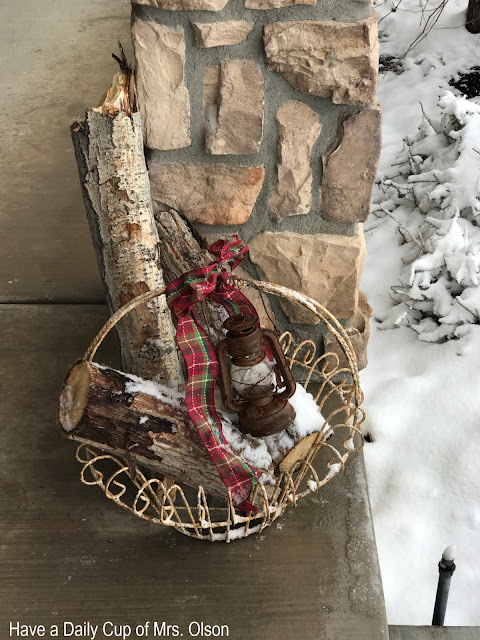 You have created a great entry way for your guest to feel warm and welcome. I love everything. 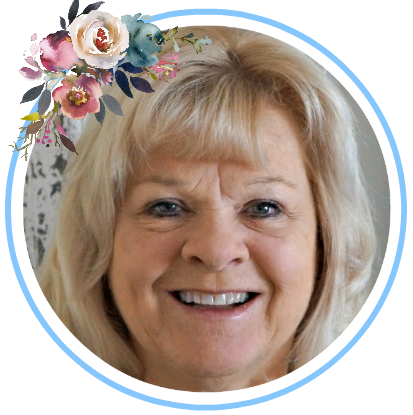 It is so wonderful to see you in the blog world so soon after your recent diagnosis and surgery. You're amazing! Love your porch -- a welcome addition to your neighborhood, I'm sure. 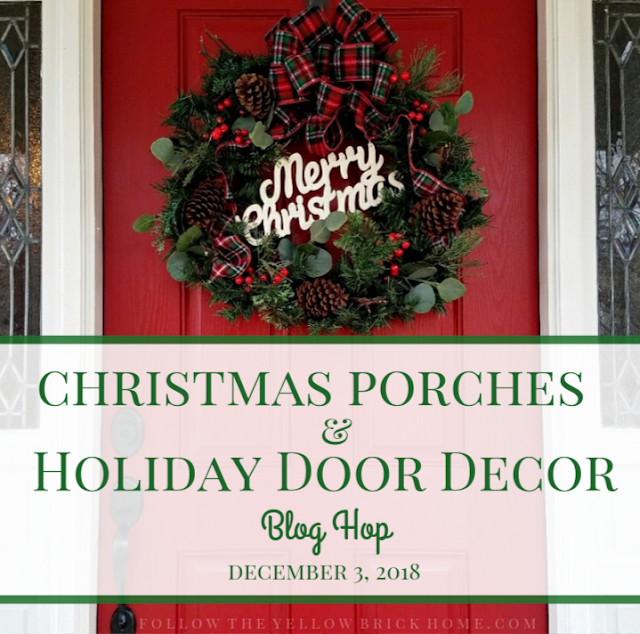 Your porch is so pretty and festive for Christmas. I love your vintage style and poured over all of your pictures. I've always wanted a Santa blow mold and I love the three that you have. 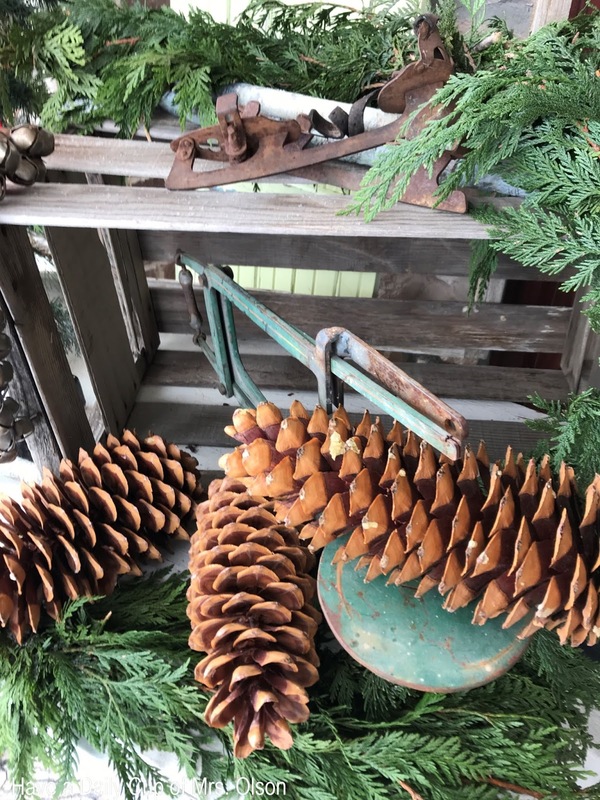 I'm sharing my vintage porch decor tomorrow on my blog and I hope that you'll stop by to see it. I also want you to know that I've been thinking about and praying for you. What a wonderful treat to have snow! Your porch is adorable. I found a blowmold snowman once at the thrift store for $10.00. I gave it to my brother but have always questioned the wisdom in that. Your collections are amazing as usual. 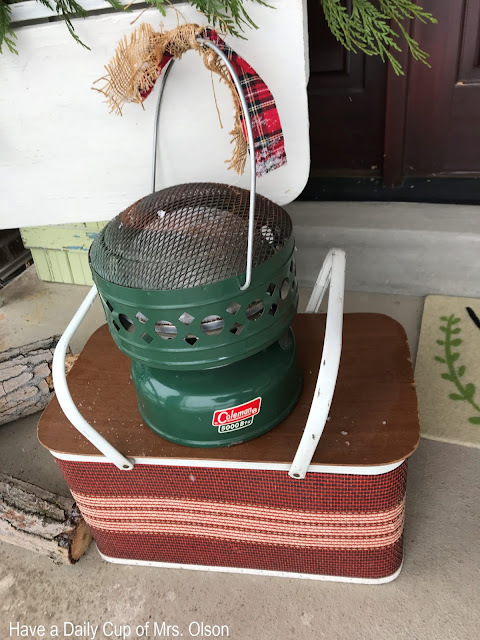 The Coleman heater is a gem. I just love your Santa themed entryway! Those ginormous jingle bells are the bomb! I love all the greenery and the big star on the vintage door. 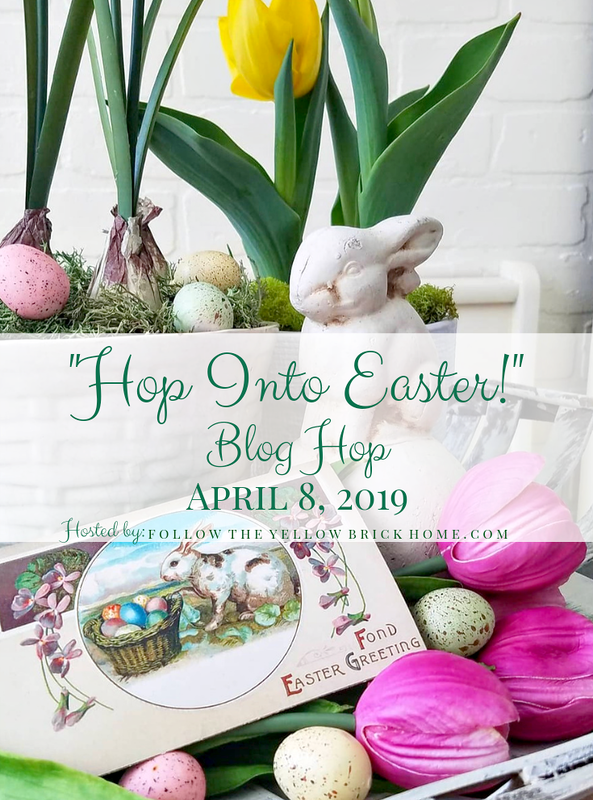 So happy to be hopping with you! 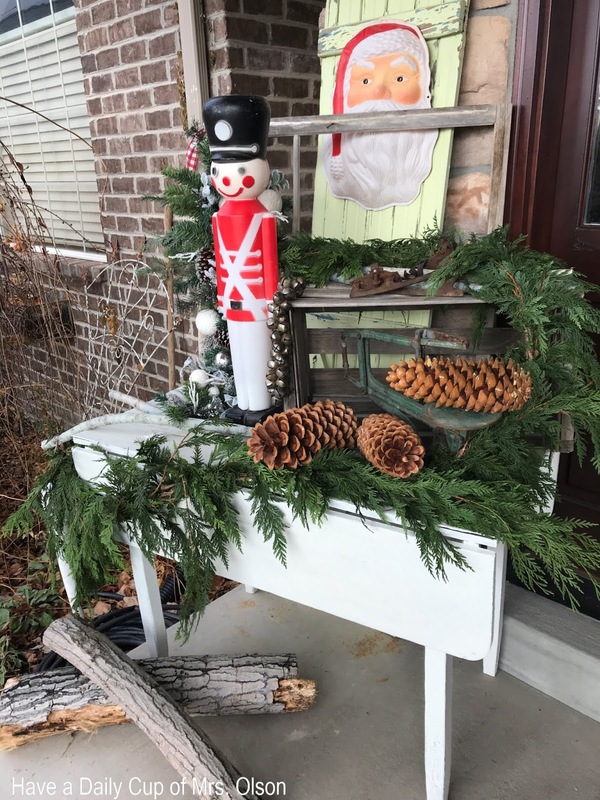 So glad you felt good enough to join us, Jann, and good enough to decorate your porch for Christmas. It's adorable! I love the ladder with the green swag running down; great idea! The snowflakes were perfectly timed for your pics; lucky you! Your porch makes your whole home look inviting. It is quite a showpiece if you ask me. Your porch looks wonderful. I noticed the large jingle bells immediately. They're amazing and love the size. I have never seen large scale like those. Love them. I think of you often and say a prayer. 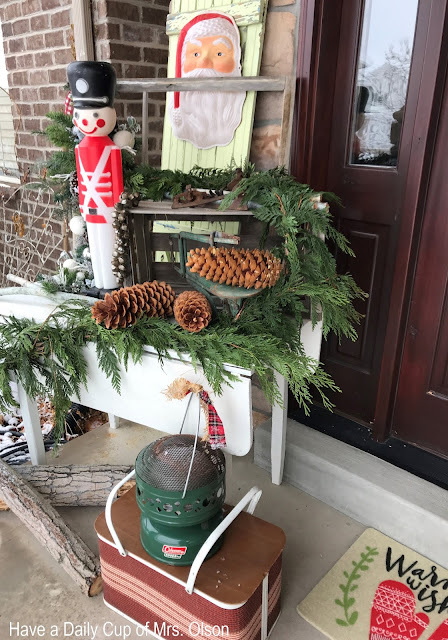 Wonderful porch,Jann!How amazing and inspiring!Hugs! Your porch is so inviting for the holidays. 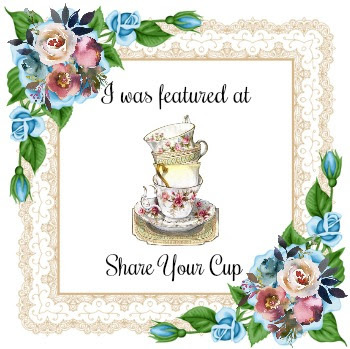 I am so glad you are part of the blog hop. Nothing better for a Christmas feeling than SNOW! I love your porch -- so inviting and fun. I bet people driving by stop and take photos! 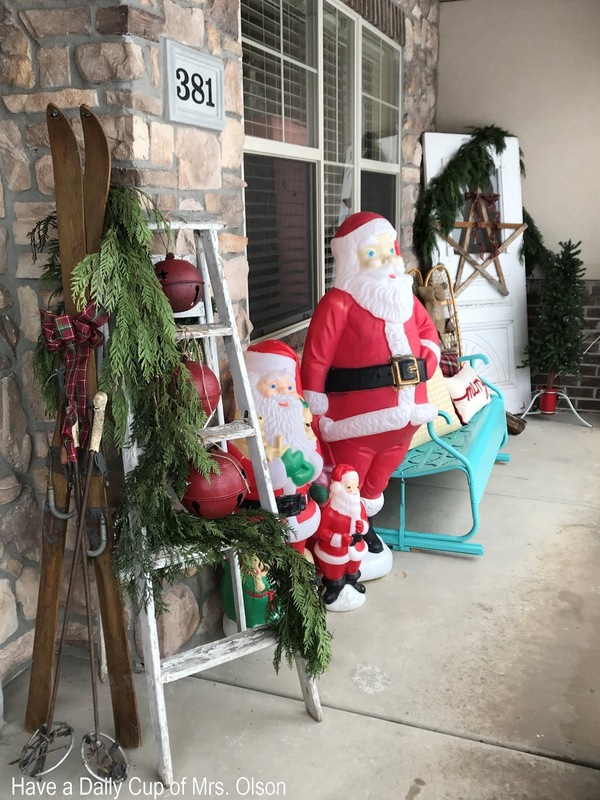 Your porch just made me smile, the Santas are just the touch we all need this time of year. What's the saying, "May you always look at the stars and search for streak of light that may be a sleigh?" I truly believe we need to nurse the child in ourselves to be happy adults. Grins, thanks for the smiles...and search for the stars. You have the most amazing porch decor I have ever known! Love the large, medium and small Santas. They remind me of when I was young. 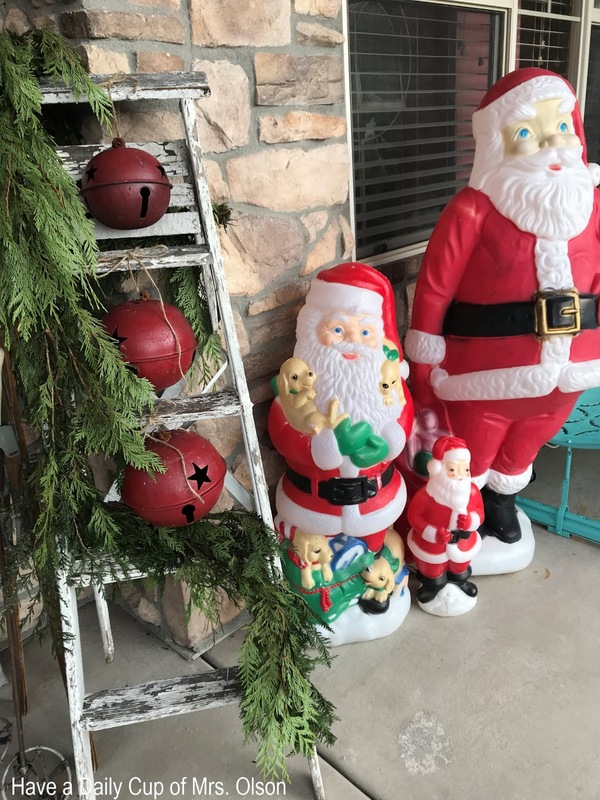 Loving all of your porch decor!! Those Santas are sooo cute!!! And, the snow makes it look so peaceful and so magical!! I love your Chrismtas decor!!! 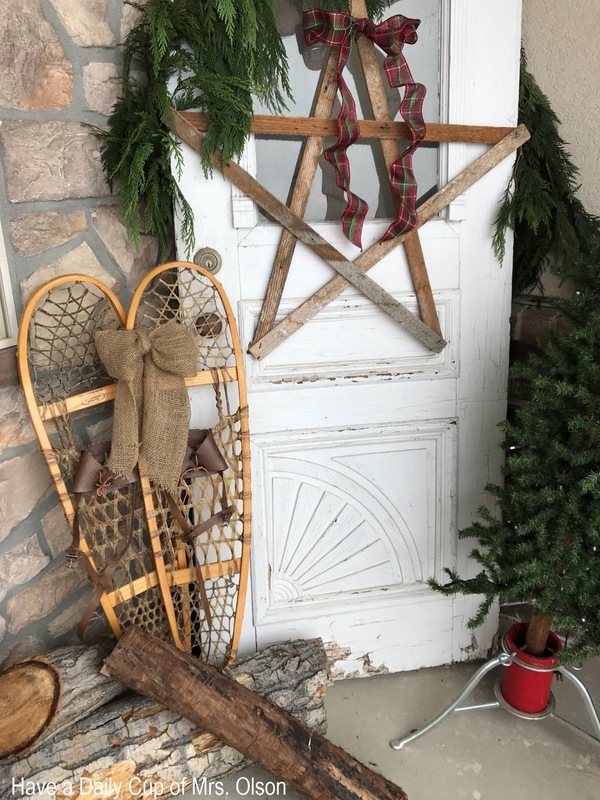 Jann, love your decorated porch. You have such a gift, and great stuff! I love blow molds too. I've got several tabletop ones, still hoping to find a large one at a thrift store sometime. Gorgeous, Jann! I love the contrast of those red santas against your swing...that's a total wow!! So glad to hear you're feeling well, my friend. xoxo Hugs to you!! 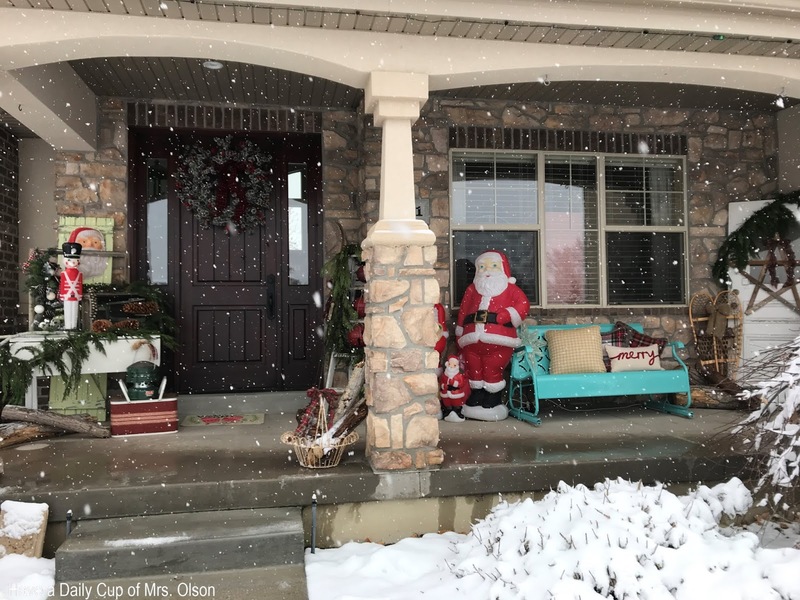 I love your porch this Christmas. Seeing your ladder reminded me that I wanted to set it on the porch, but I forgot. And your bells on the ladder are so cute. I imagine there is a bit of snow on the porch now after seeing some of Kim's snow pics lately. I'm so happy to see you on the hop with us. It is all so wonderful! 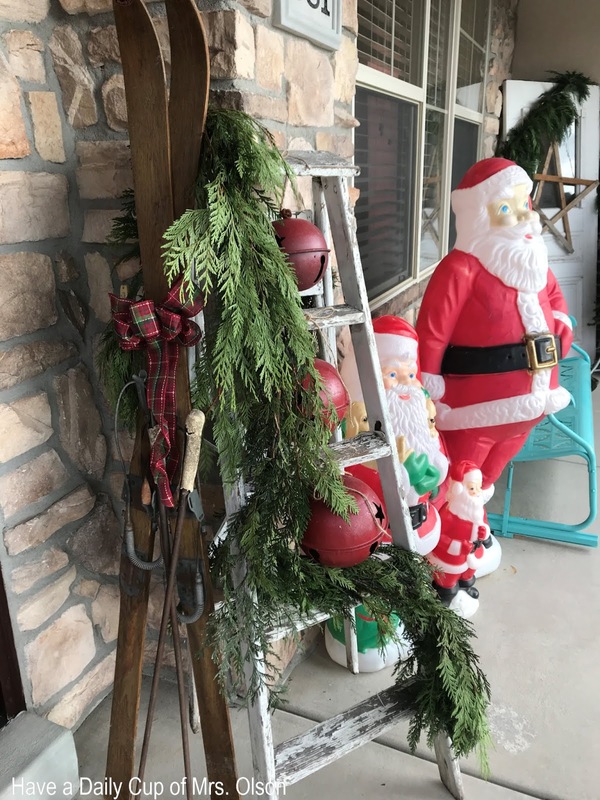 I love the blow molds of course but that ladder with the garland and bells is beautiful! 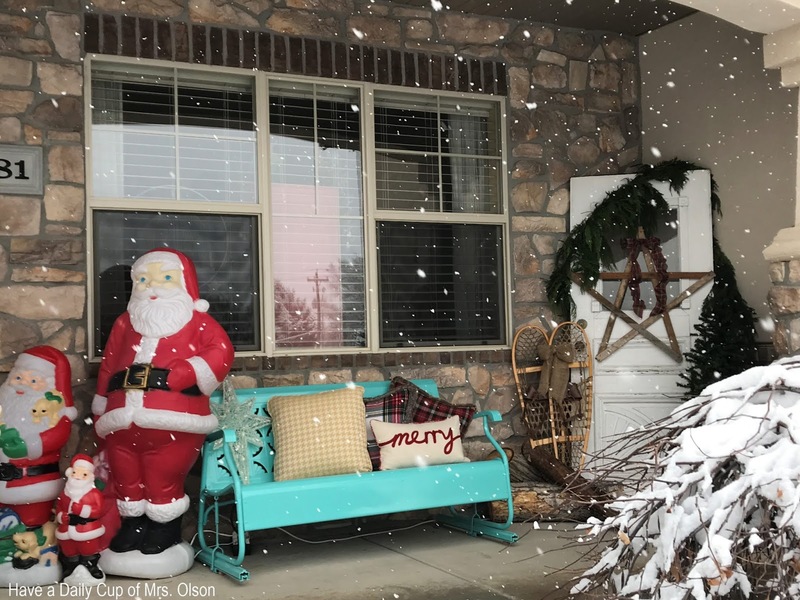 You have created just a perfect winter and Christmas porch with so many treasures, and how delightful to see the snow in these photos! Jann we are all so happy and blessed to have you hopping with us this week. You amaze and inspire me! Jann, you always create the most beautiful displays! 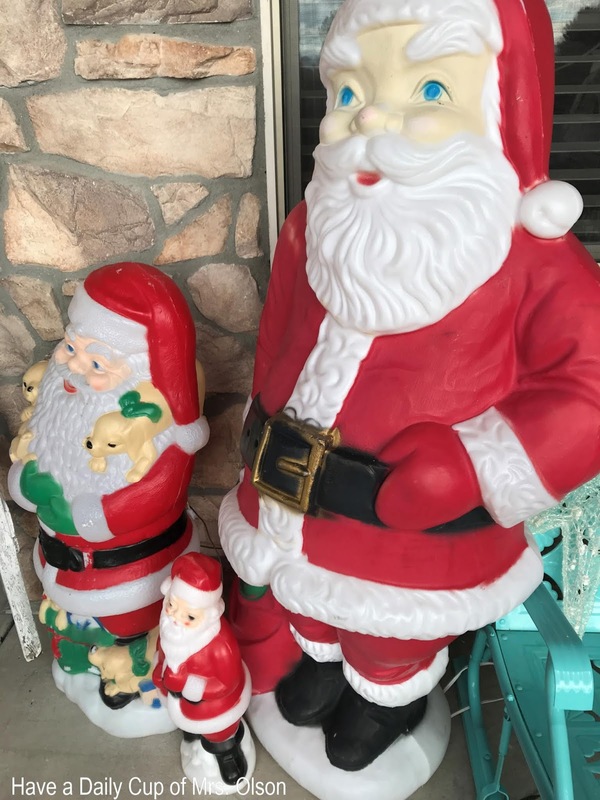 You have so many pretty treasures, but I think my favorite on the porch is the trio of Santas. I can't believe that you only paid $5 for the large one. I'm so sorry that I am so late to comment. My youngest has been very sick with the flu. It has been so much fun to be on the tour with you. Merry Christmas!! !